Designer Tom Hall created the Doom Bible, which was an extensive design document on what the game was to be about. You can still read it today in various places but it speaks to a game that’s a bit higher concept that Doom would become, but still retains the heart and soul of the game. Originally Doom was planned to have a deep engrossing story with multiple protagonists and interactive features that I’m betting would modify the story. It’s clear that Hall was focused on a deep single player experience that would probably be considered more horror than anything else. John Carmack, on the other hand, was much more focused on gameplay. He envisioned a world that combined Aliens and Evil Dead II where zombie men and creatures from hell roam the landscape as a danger to the player character. He wanted the protagonist to be the player, he wanted something more action packed than Wolfenstein 3D had been, and he definitely wanted a simpler design. This would come to a butting of heads between Hall and Carmack that would eventually result in Hall’s somewhat forced resignation from id Software for basically not being a team player and going along with what Carmack wanted. Most of Hall’s contributions were stripped during development and upon his leaving the company. 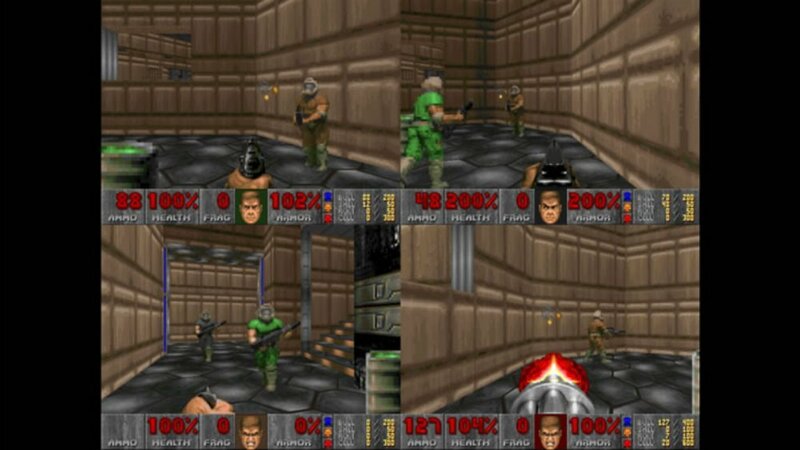 It was really John Romero and Sandy Petersen that created the levels and scenarios you find in Doom. Graphics and details, probably the part about Doom I remember most, was handled by a trio of artists by the name of Adrian Carmack (no relation to John), Kevin Cloud, and Gregor Punchatz. Back in these days a lot of the imagery you see was created much like it was for film special effects with clay models and extensive drawings around the office. The result seems to clearly create the world of a technologically enhanced Hell. Finally the pulse-pumping soundtrack was handled by Bobby Prince, who you can thank for just about every influential first-person shooter soundtrack coming out of id Software and Apogee in the 90s. Every time I hear that opening theme in the first level I get a smile on my face because there are literally no enemies but the music sounds like you’re surrounded. It’s as if to say “let’s do this!” as an opening to the game. With this combined team Doom was created in just under a year and was a massive success the moment it hit gamers in the form of Shareware. If you’ve never played the game it basically tells a tale in 3 acts, although to call Doom‘s story even a plot is a stretch. In the first chapter you are a space marine (aptly named “Doomguy”) on a Mars space station after being ostracized there by a commanding officer. As is the case in these games, scientists started screwing with portals and opened up a gateway to Hell. You frantically work your way through the base killing zombified comrades and crazy aliens before stepping on the wrong portal and being ambushed by an onslaught of enemies. 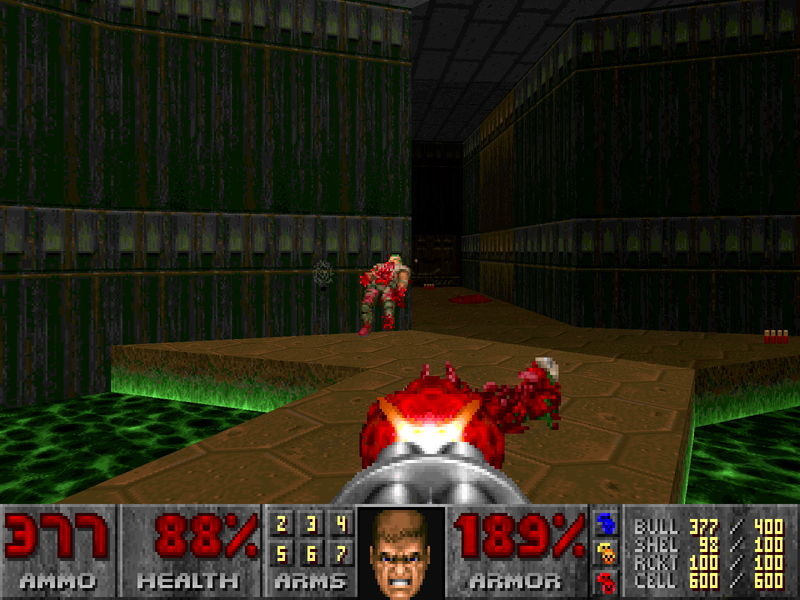 The rest of the game takes place in Hell, but one that has been technologically enhanced, suggesting that perhaps the scientists were sharing with the demons for some time. It’s the ultimate cyberpunk fear come to life as you take on creatures that literally have the name “cyber demon” although the brunt of tech/demon hybrids won’t show until the sequel. I remember when the game came out parents were going crazy over the fact that you would see blood, guts, exploding creatures with giblets of blood dropping to the floor, and of course demonic symbolism as far as the eye could see. By the third chapter you are seeing pentagrams, decapitated heads on spikes, and just about every devil symbol a Christian mother fears when looking at rock popular culture such as Black Sabbath or KISS. It was so controversial at the time it came out – something all forms of counterculture deal with throughout history – that David Grossman, a man who dedicated his life to study of killing psychology or “killology” as he puts it, called it a “mass murder simulator.” The consensus was that it would literally teach you how and show you the joys of killing, so both parent groups and religious groups alike rightfully fought against it. Sadly Doom would even be brought back as blame for the tragic Columbine Massacre on April 20, 1999 in which teenagers Dylan Klebold and Eric Harris shot up a Colorado school. Doom would also be analyzed in 36 other violent incidents in history. For us kids playing games, it couldn’t have made us want the game more. id Software and publisher GT Interactive felt the same way as the game was ported and expanded upon greatly in 1994. 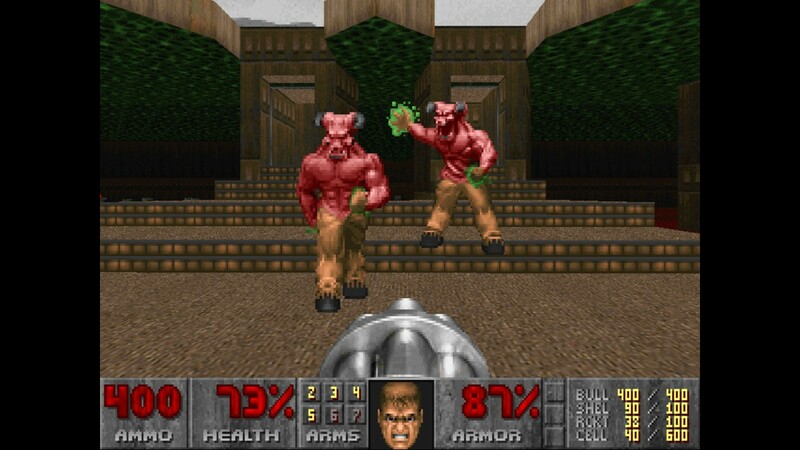 Doom not only received an expansion – a 4th episode entitled “Thy Flesh Consumed” – but it was ported to just about every console that was around at the time. We here at GH101 actually analyzed all of the releases in a video that you are welcome to check out. 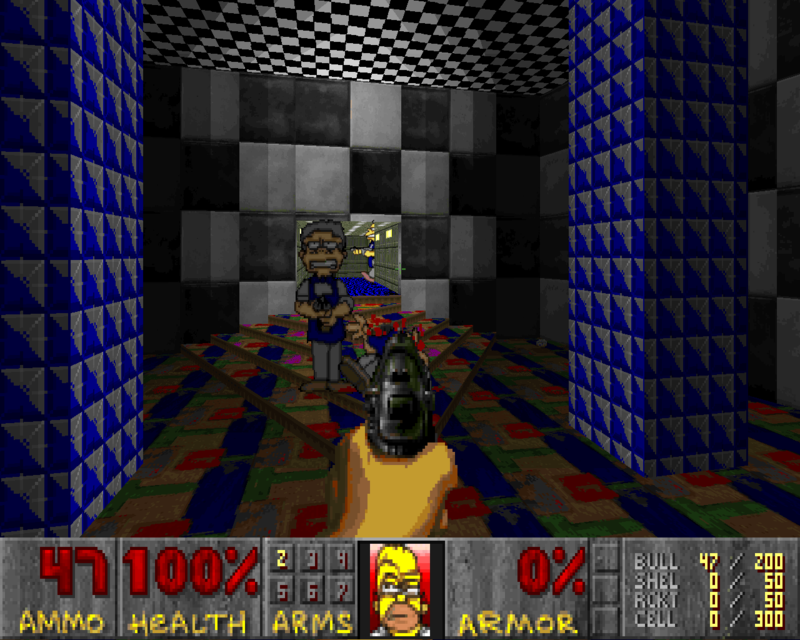 Carmack hadn’t just created Doom to be a stand alone game (he had learned that lesson with Wolfenstein 3D), but rather an engine to be expanded upon thanks to the WAD system. WADs, standing for “Where’s All the Data,” is basically the database of everything that makes up Doom. While the rest of the program handles the engine, the WAD you load handles the art, textures, level design, and even the music and sound effects. As a result, communities started messing with the Doom WAD a few months after release and were responsible for some of the first TCMs (Total Conversion Mods) seen in PC gaming. Doom could become anything the programmers wanted. That’s why you can easily find simple WAD manipulation like the “Barney WAD” that replaces all Imps (a common enemy) with the big purple dinosaur from kids television, complete with him singing his signature “I Love You” song as he maniacally approaches the player to rip his eyes out. From there players made entire campaigns that completely re-worked Doom‘s design and story, some even re-creating major events in pop culture like movies. This also made it easy for the actual developers id Software to create new levels and expand upon the game themselves. These expansions included the 4th episode referenced before but also gave way to releases like Ultimate Doom and Final Doom, which are all expanded levels in the same engine. Even the N64’s Doom 64 uses a custom WAD that runs the engine on the console, meaning that there’s probably a way to put the fan mods into that game were you to use Doom 64 compatible assets. The WAD system made Doom the custom powerhouse for the developers and community alike and is just one of a few examples of how Doom embraced the oncoming Internet craze and used it to build an audience. While in 1993 not everyone was online, there was plenty of Internet activity thanks to Doom. For starters, it was a popular way to distribute the game in the form of Shareware. Some got the game from a PC magazine, others got copied disks handed from a friend, and still others downloaded it off the web, but everyone had the Shareware version of Doom. It consisted of only the first episode of the game and I don’t believe it allowed online play, but this was basically all most of us needed. Despite Doom selling more than 3 million copies, it was determined that 15-20 million people played Doom in some form. It was also considered the killer app for both operating systems like MS-DOS and consoles, which is why so many ports exist. 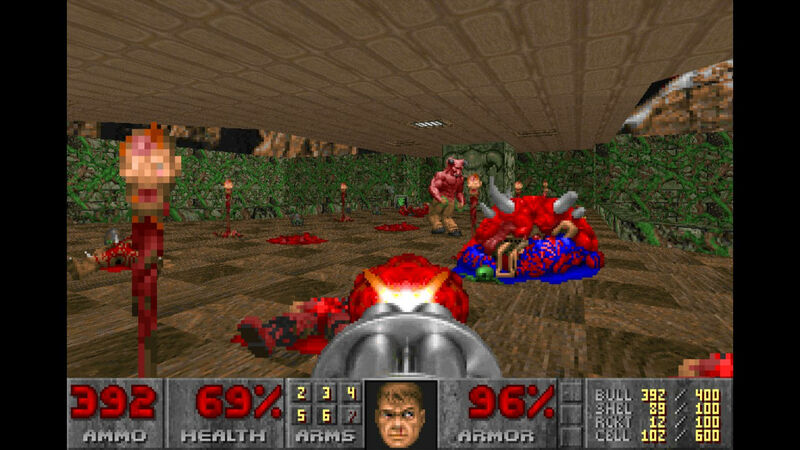 Doom also gave way to the first server overloads on ISPs like America Online and Compuserve, which led to the Anti-Doom package that would terminate Doom games when detected on a server. That didn’t stop homes, college campuses, and large groups from playing endless games of 2-4 player competitive deathmatch games. This is probably what led id Software to focus just as much with online gameplay than with single player. Whether it was the sign of Hell on Earth, the advent of gaming on the Internet, a new distribution model, the genesis of a new genre, or the catalyst for widespread game mods, Doom was significant in so many aspects of gaming today. It redefined the types of games played through most of the 90s, especially on PCs, and kickstarted massive careers for those involved. In 2015, Doom was inducted into the video game Hall of Fame alongside Super Mario Bros. and Tetris. Even id Software itself stands strong today as an ongoing developer that is set to release the fourth official Doom iteration at the end of the week. While the original staff are absent, id lives on through Doom.